On October 4, 2017, volunteers from The Hartford joined KNOX staff at the Broad Street trail entrance to Bushnell Park to plant native, drought-resistant trees. Thanks to a $5,000 Keep America Beautiful/Lowe’s Community Partners Grant, these newly-planted trees enhance Hartford’s section of the East Coast Greenway, a multi-use pedestrian trail spanning from Florida to Maine. Volunteers successfully replaced five dead trees with trees that will thrive for years to come. Many trees are already suffering as climate change raises temperatures and increases the occurrence of extreme weather conditions such as droughts. 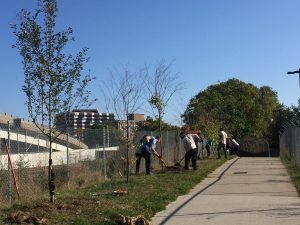 This project provided the Hartford community with trees that will flourish with the changing climate rather than die off shortly after being planted. As they develop, these trees will filter air pollution, collect storm water runoff, decrease greenhouse gas emissions, and reduce the urban heat island effect. In addition, they will beautify and enhance the park, provide wildlife habitat, and give off much-needed shade. By removing the trail’s leafless, dead trees and replacing them with healthy ones, we added beauty and life to the area. These trees truly bring green back to the greenway, inviting passersby to explore the trail. Our Trees for Hartford Neighborhoods program works to reforest the city of Hartford by planting 20,000 trees in 20 years.